routine testing - Strategic Consulting, Inc.
We’re seeing an emerging trend in food safety testing that we believe has big implications for diagnostic equipment manufacturers: Pathogen analysis is increasingly being conducted outside of food plants in contract labs or corporate testing centers. Food Micro-5, Strategic Consulting’s latest market research report on food safety microbiology testing, shows sizable growth in both routine and pathogen testing in the U.S. food industry. 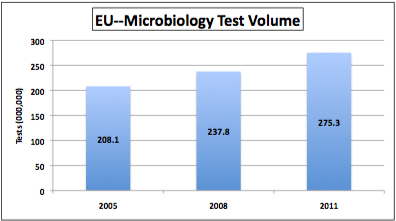 With pathogen testing growing at twice the rate of routine testing, it all adds up to increased opportunity for diagnostic test manufacturers.